Female goalie Dang Thi Kieu Trinh won her third Vietnamese Golden Ball Award, while Dinh Thanh Trung claimed Best Male Player of the Golden Ball Awards for the first time. The Golden Ball Awards 2017 ceremony was held in Ho Chi Minh City by Sai Gon Giai Phong (Liberated Saigon) newspaper, on January 2. The most important award, the Vietnamese Golden Ball 2017 for the Best Football Player of the year, went to midfielder Thanh Trung of Quang Nam FC. Trung played a key role in Quang Nam’s victory in the V-League this year. The 29 year-old player was also key in helping the national team during the Asian Cup 2019 qualification rounds. Trung received the highest score of 498 points during the nomination. Meanwhile, the first and second runners-up were Nguyen Anh Duc (Becamex Binh Duong - 285 points) and Nguyen Quang Hai (Hanoi FC - 88 points). In the female category, goalkeeper Kieu Trinh won Best Female Player for the third time, after helping her HCM City women's team to claim the third successive national women's football championship, as well as helping the national women's football team to bring home gold from the 2017 SEA Games. 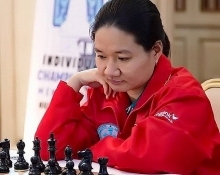 The Silver Ball for a female player went to first runner-up Nguyen Thi Tuyet Dung (Ha Nam team), while the Bronze Ball belonged to Huynh Nhu (HCM City team). In addition, the organisers also presented the Golden Ball Award for the Best Futsal Player to Phung Trong Luan from Thai Son Nam club. Luan and his teammates came third in the 2017 AFC Futsal Club Championship. 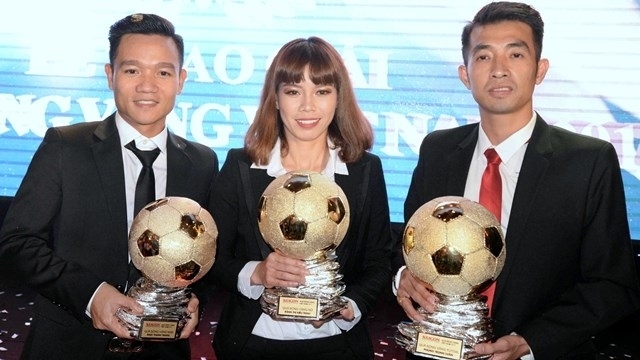 Doan Van Hau of Hanoi FC won Young Male Player of the Year, while Nguyen Thi Van won Young Female Player. Claudecir Dos Reis of Quang Nam won Best Foreign Player for scoring 12 goals for his club. The key player of the national squad and Hoang Anh Gia Lai team Nguyen Cong Phuong was awarded the Most Favourite Player. Hosted by Sai Gon Giai Phong newspaper since 1995, the Vietnam’s Golden Ball Awards ceremony is an annual event for the country’s best football players during the previous year. The awards are widely regarded as the most prestigious trophies of Vietnamese football.